When it comes to a gentleman’s dress wardrobe, size does in fact matter. Actually, it matters a great deal. An otherwise terrific outfit can be utterly ruined if the fit is terrible. Most men have a basic understanding of what size they are or should be. This usually involves measurements concerning the pants waist, shirt size, & suit. What often doesn’t receive equal consideration is the dress shoe. Some gentlemen are perfectly fine with entering a shoe department and reaching for a dress shoe that arrives in their size. However, not all dress shoes are created equal. Have the gentlemen ever noticed that some dress shoes are more comfortable than others? While I fully understand the “breaking in” process of a dress shoes, no acceptable pair of oxfords should be painfully constricting on the feet. So, why is it that dress shoes in an identical size can fit so differently? The answer can generally be discovered within the construction. The genesis of a dress shoe begins with what is called a last. By simple definition, the last is a mold that mimics the shape of a foot upon which the dress shoe is constructed. The last is what gives the shoe its shape, form, and silhouette. 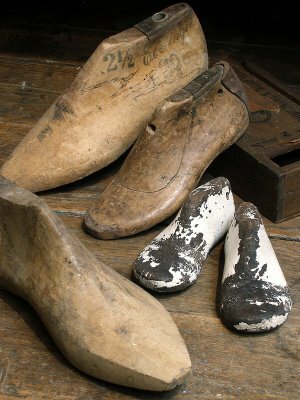 Generally made of wood, shoemakers use a variety of lasts to construct & design different models of footwear. This is why it is important that you fully understand the shape and the size of your foot. The last is what determines the grade of fit you will experience when trying on your selected footwear. So, the gentleman probably does not require a “breaking in” period for the shoe to become comfortable. The discerning gentleman just needs to be more studious in his shoe selection. For example, a few years ago I bought the Allen Edmonds Park Avenue. Now the Allen Edmonds last that the shoe is built on happens to be slightly narrower than my foot. Although I wear a shoe sized 12, the Park Avenue was cut in a fashion that caused some discomfort for my feet. Now, I could have stuffed my feet in them and walked enough to stretch the leather, but that would be too bothersome. In addition, my feet would probably be aching during that breaking in process. The solution? Well, most shoes come in a standard “D” width. A general working scale for shoe width ranges from A through E; A being the slimmest while E is the widest. Knowing that the Park Avenue was designed on a last slimmer than my foot, I opted to go up in width to accommodate girth of my foot. So, instead of a 12D, I purchased a 12E. Problem solved. Knowing what shoes fit your feet correctly will require some time and effort. My suggestion is to find a brand that is suitable to your liking and offers a variety lasts to accommodate your tastes. I usually wear Johnston & Murphy and Allen Edmonds because they offer the variety that suits my style. Your feet have a lot of miles of them, so you may want to have them measured again for accuracy. Head to the nearest department store and have a salesperson measure your foot. That has most likely to have changed a little since middle school…right? And don’t forget to venture out into the shoe department during the latter part of your day. Your feet swell as the day progresses, so the gentleman would be better served to try on shoes when his feet are at its biggest size. What you don’t want to do is purchase a shoe early in the day and have your feet expand to uncomfortable levels because the fit is somewhat off. Again, this may sound like a ton of hassle. However, it is this level of attention to detail that elevates a gent’s sartorial pedigree. Sophistication resides in the minute details. Pay attention. Here at The Gentlemen’s Standard, we are staunch proponents of utilizing cedar shoe trees. The wooden shoe trees help maintain the shape of your dress shoes in addition to absorbing moisture and eliminating odor with its aromatic qualities. However, the traveling gentleman may have concerns about the added weight to his luggage when they are tucked away gently inside his balmoral wingtips. Not to worry. Plastic shoe trees and even crumpled newspaper can perform as a suitable substitute during your business travels. The gentleman can even toss a few cedar chip blocks inside his shoes if they have a tendency to emit foul odor. And I sincerely hope they don’t. If you are a gentleman on the move and you have at least 2 pair of dress shoes in your possession, this may prove to be a viable option. Especially if the gent is carrying some casual shoes along for the trip. 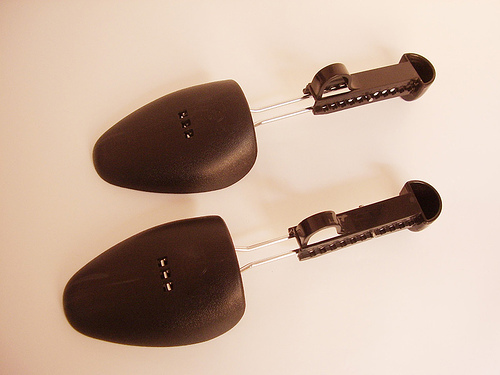 Plastic shoe trees can be found at any shoe store such as DSW or even a place such as Target. No need to get bogged down by unnecessary weight, lighten the load and spring for a pair of plastic shoes trees designated for those times in travel. You will be glad you did. Honestly, I wholeheartedly understand the fashionable apprehension when it involves leather dress shoes accompanied with rubber soles. The unlikely partnership poses quite the sartorial dilemma for the well-heeled & smart gentleman. Is it possible for an exquisite leather dress shoe to possess a rubber sole and still be considered elegant? To some dress shoe enthusiasts, the answer is a blistering no. To the purist, the supple leather of the oxford must be joined by a quality leather sole. A rubber sole only works to diminish the formality & professional presentation of the oxford. However, this viewpoint is probably a matter of taste & nuanced preference. A taste that is likely a remnant from a past where older gentlemen long for the days where men dressed like men; and they took extreme pride in doing so. Nevertheless, time progresses and stylistic sensibilities evolve. Technology has made it so rubber soles are not as thick & bulky; thereby destroying the graceful silhouette of a leather dress shoe. In my opinion, a gentleman can indeed wear leather shoes with rubber soles. They provide cushion for those gents with foot or back ailments. They provide traction on slippery surfaces for gents who find Wellington Boots unsightly. A handsome pair such as the Allen Edmonds Quinton (pictured above) is a great compromise between practicality & style. The gentleman should keep a couple of things in mind: 1) Select a leather shoe by proven companies such as Allen Edmonds, Cole Haan, and Johnston & Murphy. 2) Ensure that the sole is relatively non-intrusive & not too chunky. 3) If the sole does run on the chunky side, your leather shoe may be better suited for business casual duty. So, this Winter is a fine time to add a couple to your rotation. By doing so, you can also extend the life of your dress shoes with leather soles. That my friends is always a wise move. Gentlemen, it is becoming to be that time of the season. As much as we hate to face the impending reality, snowflakes will begin their slow descent from the atmosphere. Not that I hold a grudge against the white fluffy stuff, I just abhor navigating city streets in it. Michigan drivers are notorious for their Evel Knievel type of driving. The presence of snow only works to increase the level of danger while driving. So, in an effort to make our streets safe for driving; rock salt is employed to help melt the ice & snow. Great stuff. Not so great for your shoes, especially a gentleman’s dress shoes. If not properly maintained, rock salt can gradually eat away at leather soles. This slow degradation will leave leather soles uneven and misshapen. 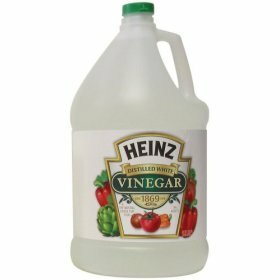 To combat this steady erosion, vinegar can be a gentleman’s best companion when the parking lot is overloaded with rock salt. Equal parts water and vinegar, this handy mixture will save your shoes and your walk! A gentleman’s sleek dress shoes may possess some very striking similarities to the tires on his automobile. Both assist the gentleman in his commute from destination A to destination B. Both will cost the gentleman a healthy sum of currency if he decides to purchase higher quality goods. And both will exhibit gradual signs of wear during its lifetime. For a gentleman’s shoes, it will be the slow progression of wearing out the outer sole. For his vehicle’s tires, the tread will begin to lose its depth and the ability to adhere to the road. Tire rotation and eventually tire replacement will remedy this problem. However, what can a gentleman do with his dress shoes? Having a closet full of dress shoes for a significant shoe rotation can prove costly and space monopolizing. And buying new shoes to replace old ones is costly also. This is a problem I am encountering at this moment in time. After buying a pair of Magnanni dress shoes, I am noticing uneven wear on the outer soles near the toe. 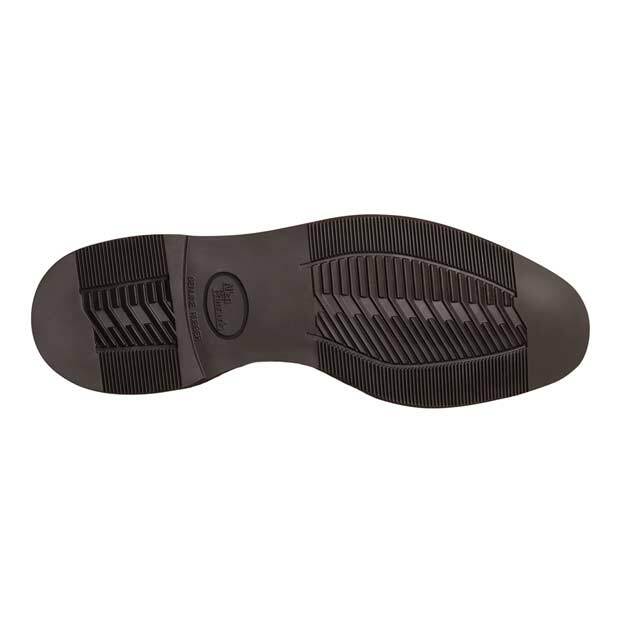 Due to the shoe’s Bologna construction (the outer sole is much thinner than a 360 degree Goodyear Welt), the wear has been enhanced and hastened. So, to slow down the advancement of outer sole deterioration; I have decided to employ the usage of shoe taps. Rubber shoe taps. I choose not to be confused with Gregory Hines, so I will have the shoe cobbler install rubber taps on the key points of worn sole. It should cost me no more than $5.00 per pair and that trumps buying a new shoe altogether. I understand that a gentleman can purchase a kit and install his own shoe taps, but I will leave this to the professionals. I cannot afford to ruin a good pair of dress shoes. The shoe cobbler assured me that the process can be done as I wait, as the work should take no more than 10 minutes. 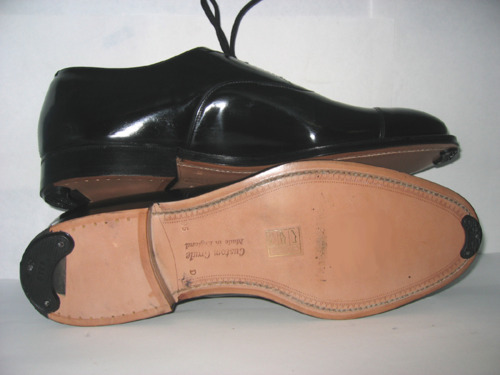 Usually taps are placed near the toe and heel area, with exact placement dependant upon what area needs to be addressed. As soon as I see the results, I will be sure to check back in with an update. Talk to you soon. Great information Glenn. I have read your blog for quite awhile. I live in Austin, Texas and everytime I see your site it makes me feel cool and daper. Thank you Mr. Steven, glad you enjoy the reading. Mr. Palmer, I feel privileged to have visited your website. This is an amazing collection of articles and tips for the urban gentleman. I particularly like the section entitled, ‘The Standard”, for it is not only necessary to dress the part, but act the part as well. Thank you SO very much for checking out my site. I really try to deliver content that is meaningful and enjoyable to read. Thank you so much again for reading. Mr. Palmer, Sincerely this an outstanding page. I believe we should inspire each other to be Gentleman.. Thank you for dropping in. I am so blessed to have a message to reaches many people. Glen…like the tip about the vinegar….I did not know that. I live in Philly and typically won’t wear my leather bottom shoes in the bad weather for the very reason you mentioned. It’s cold here but dry and yesterday I did sport my Allen Edmonds distressed leather McTavish’s. Yeah, here in Michigan, I usually wait to break out my good shoes – unless I have to wear them. Our roads can get really nasty. But being on the East Coast, you know that well. I absolutely love this. Although I’m a lady I appreciate the fact that this info is avaliable for men!